Grass grown in shade often becomes sparse from lack of sunlight. Choosing a seed mix that is tolerant of moderate shade can help, together with appropriate turf care. Suitable for: Lawns in moderate shade. Special attention is required for all lawns in shade. Most turf grasses require four to six hours of full sun each day. Without this turf can deteriorate, becoming less resilient and prone to disease. Specific measures may be required for turf under trees with dense canopies, such as oak, beech or conifers that block out nearly 95 percent of the sunlight in summer. Turf rarely does well in such dense shade. In addition, tree roots compete for water and nutrients and the dripping of water from their canopies can be damaging. Selecting shade-tolerant grass mixes, which are now widely available, is the most important factor in growing turf successfully in shade. Fescue grasses are better at coping with shade, drought and poor nutrient levels. In damp soils opt for a mix with more bent grasses. However, bear in mind that even shade-tolerant grasses need some light. Consider removing selected trees to improve light levels. Where this is not possible, prune overhanging trees to increase light levels. This may involve crown lifting, where the lower trunk is cleared of branches, or crown thinning, where the entire canopy is thinned. A tree surgeon can advise on the best method. See our page on hiring contractors for advice on finding a tree surgeon. It is actually beneficial to have a turf-free zone of at least 1m (3ft) around the base of trees, to avoid grass competing with trees for moisture, and vice versa. When planting new trees, consider using species that cast only light shade, such as Betula, Gleditsia and Robinia. Cut lawns in shade less frequently and to no lower than 6cm (2½ in). Preferably, keep the height of cut as high as 7.5-9cm (3-3½ in). Always remove the clippings. If lawns beneath trees require watering, irrigate heavily and infrequently to encourage the trees to root deeply. This will reduce the extent to which they compete with the lawn. Lawns in shade are best fed in autumn, just prior to leaf fall. High potassium (K) autumn lawn feeds are particularly beneficial to grass growing in shade. You can also feed lawns in early spring about one month before trees begin to leaf. Use half the rate of spring/summer lawn feed applied to turf in full sun. Moss tends to out-compete turf grasses in cool, moist, shady situations. Chemical treatments only provide temporary control unless the growing conditions are improved and shade is reduced. See our advice in moss in lawns for more information. Lawns showing signs of deterioration can be over-seeded with a shade-tolerant mix. See our advice in lawn care: spring and summer for more on how to do this. However, if the soil is compacted, of low fertility and heavily infested with moss it may be better to re-seed or re-turf the whole lawn. 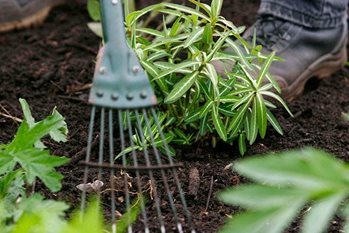 In areas of dense shade cast by buildings or trees it is more appropriate to consider alternatives such as decorative mulches or shade tolerant ground cover plants.